Open Stage at Arts Umbrella is one of our longest-running community programs. In 2017/18, we welcomed 37 students for a high-quality, free-of-charge theatre program. 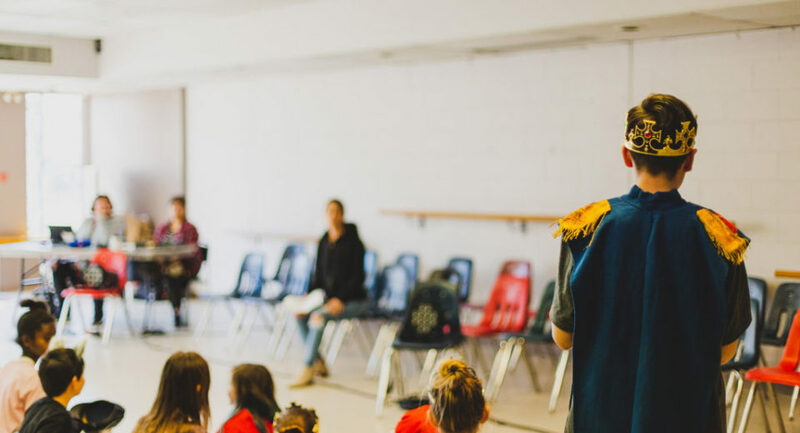 Based in a neighbourhood that demonstrates high vulnerability, Open Stage creates equitable access to the same tuition-based programming available at our core facilities. Under the guidance of Susanne Moniz de Sá and Roselle Healy, professional actors and longtime Arts Umbrella Theatre instructors, students learn skills and techniques such as memorization, line delivery, and character development. They also explore creative expression through storytelling and emotional reflection. But the most incredible thing we witness year after year is the personal growth of each and every one of our students, who take away more than just fun theatre games; they develop confidence, discover tools for communication, and learn to work in teams. The year-long format allows for greater engagement between students and instructors. This type of engaged programming builds rapport, openness, and emotional safety as an ensemble.